Hanoi (VNA) – Vietnam and Singapore have rooms for extensive engagements, particularly in the sea, high-quality workforce, and startup fields, Deputy Prime Minister Truong Hoa Binh said during talks with his Singaporean counterpart Teo Chee Hean in Hanoi on March 22. 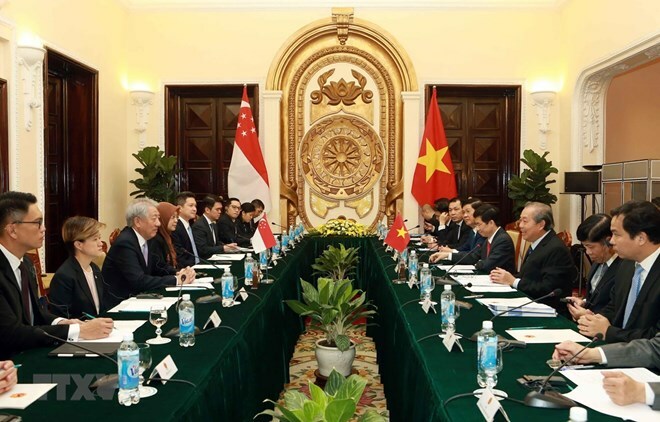 He affirmed that Vietnam values developing the strategic partnership with Singapore, which is among its leading partners in ASEAN and in the region, suggesting the sides hold regular high-level visit exchanges and meetings. Binh praised the guest’s contributions to boosting the Vietnam – Singapore strategic partnership in politics, diplomacy, security-defence, trade, economy, and people-to-people exchange. He said the partnership has grown toward practical outcomes in recent years, with politics-diplomacy ties deepened based on trust and the maintenance of exchange of visits across all levels and all channels. Cooperation in defence- security has been deepened while that in culture, science-technology, and education has recorded positive progresses. Bilateral trade hit 7.66 billion USD last year, making Singapore the 4th biggest trade partner of Vietnam in ASEAN. The country was also the 3rd largest foreign investor in Vietnam with a total capital of 48 billion USD. The Vietnam – Singapore industrial parks in Vietnam have showed effective operations, creating jobs for locals and bringing mutual benefits to both countries. In term of multilateral relations, the two countries shared similarities in their views on strategic security issues. Both valued the promotion of solidarity, self-reliance, and ASEAN’s central role in the evolving regional architecture. They prioritised boosting connectivity, narrowing development gaps, and strengthening collaboration regarding the East Sea issue. They have worked closely together at ASEAN and UN forums. The Singaporean Deputy PM said his visit aims to bolster bilateral ties. He took the occasion to congratulate Vietnam on its successful host of the second summit between the Democratic People’s Republic of Korea and the US. He said both countries have faith in developing a strong ASEAN Community and expanding partnership beyond the bloc. He expressed his hope that Vietnam will have a successful ASEAN Chair next year.